Proper body mechanics is important during the golf swing. Nearly every joint is involved during the golf swing and these joints must work efficiently and repeatedly to produce a consistent golf swing. Poor joint mobility (often attributable to soft tissue restrictions including muscles, tendons, ligaments, nerves, and fascia) is a factor in many swing faults. Muscles which cross a joint on each side must precisely coordinate activity to produce movement. Though the joint may move in one direction (for example elbow bending), muscles on both sides of the joint are active. In the example above for the action to occur in a controlled manner, the biceps muscle is active and shortening (concentric contraction), but also the triceps are also active and lengthening (eccentric contraction). If the synergy of any of the muscle groups is altered (usually short/tight), the movement patterns of the joint are affected. Muscles become shortened due to injury, from trauma, or from repetitive strains that cause micro-tears. The scar tissue which forms at the injury site is less elastic and more fibrotic than normal tissue for a number of reasons. See the footnote below for a description of why this occurs. Short tight muscles are weaker, fatigue easier and play havoc with your golf swing. They disrupt joint mechanics due to impaired coordination, reduction in power, and result in further injuries. Usually more than one muscle is involved. Tight shoulder, tightness in the hip joint, spinal / truncal restrictions, and repetitive strain injuries result in common swing faults. Excessive spinal rotation results as the body tries to compensate for shoulder rotation restriction. As most people who play golf already lack flexibility in the spine, this compensatory action can result in back injury. In addition, golfers will notice that they have difficulties in keeping their eyes on the ball and maintaining an optimal swing plane. Additional strain on the rotational requirements of the shoulder or spine can occur as a result of tightness in the hip joint. Often a golfer will compensate by lifting up during the back swing, which changes spine angle. To return to the ball, the golfer then chops down on the ball with the arms resulting in a fat shot or tries to bend at the hips and over does it also resulting in a fat shot. Conversely, if the golfer does not under compensate for lifting up, a thin shot occurs. Wrist and elbow injuries often occur when the body does not have the capacity to effectively compensate at either the shoulder or spine. The wrists are over-used to drive as well as decelerate the golf club. Due to the club hitting the ground at impact and causing a sudden deceleration of the clubhead, the wrist bears the brunt of this change in momentum increasing the risk of injury. 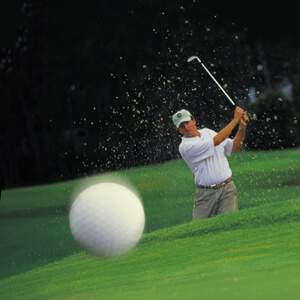 Hitting the ball thin causes increased vibrations through the upper limb, which increases injury risk. Additionally, the chances a golf swing producing a hook or a slice increases when the golfer attempts to compensate at the shoulder joint. Improving soft tissue function through a home- based stretching program goes part way to improving function by lengthening the tissue. However, in most cases, the area affected by the scar tissue and fibrosis will not improve using this type of stretching. Deep tissue work and other proprietary techniques need to be employed to deliver a therapy that addresses this fibrotic tissue so that lasting improvement occurs. (*) Footnote: Collagen fibers, which are a component of the muscle and resemble a corrugated roof in cross sections, are no longer able to properly ‘straighten out’ due to fibrosis between peaks. This causes muscles to gradually loose their stretch component. These collagen fibers are also normally laid down in an almost parallel arrangement. Scar tissue lays down in a haphazard way, reducing the collagen fibers effectiveness in lengthening. In addition, fibrotic tissue affects the effectiveness of tissues to slide past each due to adhesions between soft tissue layers and even in the fibers of the muscles themselves.